LEAVE THIS MINERALS PROCESSING PAGE HERE! Nothing beats the vast variety of international metallurgical experience of PPM Global engineers when it comes to helping our international mining company clients improve mineral recovery grades, mineral economics ROI, extending process plant life while improving process plant operator safety and minimising environmental impacts near process plant mine sites. Some of the country projects our plant construction/commissioning and metallurgical engineers have worked in are listed below. Some are pinned to the world map at the top of this webpage. It’s why “Project and Process Metallurgy” (PPM) GLOBAL truly are are the go-to global metallurgical company in the business of serving mining companies to reduce costs and increase returns on mineral process plant investment. PPM provided two Process Specialists to assist the client in the commissioning of the new 25,000 tpa copper SX EW plant. The Wetar Project is situated on a remote, mountainous island in West Timor and these geographic features added to the challenge of commissioning a heap leach, copper SXEW plant pilot plant back in 2009 but paved the way to expand Wetar into a 25,000tpa producer that is currently under construction, PPMG has been engaged again for the commissioning of this project upgrade. The Wetar Project is situated on a remote, mountainous island in West Timor and these geographic features added to the challenge of commissioning a heap leach, copper SXEW plant. PPM’s role at Wetar was to commission a demonstration plant on behalf of our client, Finders Resources. The PPM team, in conjunction with Finders Resources’ personnel, successfully achieved the production of Indonesia’s first copper cathode by SXEW in 2009. PPM initially provided a Technical writer to assist the client in all forms of safe operation procedures (SOPs) developments and formalising their documentation systems. We have also provided a Mechanical superintendent to manage completion of some outstanding works from construction as well as assisting with upgrade of safety and isolation systems. PPM’s Principal Metallurgist initially attended site to commence development of the commissioning plan for the commissioning team before handing over to our team of Commissioning Supervisors & Process Specialists. The Commissioning Supervisor was responsible for the implementation of safe work procedures (eg. Tagout, Lockout, Permit to Work etc) as well as development of all commissioning documentation, including work packs comprising an “area by area” explanation of the safety requirements, commissioning sequence and commissioning (signoff) check sheets for all equipment and process systems. Following development of the commissioning systems and documentation, a team of experienced (hydrometallurgy) commissioning personnel arrived on site and were able to safely and effectively carry out the commissioning of the complex HMP Zinc SXEW process plant. Additionally, PPM provided Mechanical and Electrical / Instrumentation support to assist with the effective testing and commissioning of mechanical, electrical and instrumentation equipment. Our involvement on this project was to complete Filters Optimisation as well as Heat Exchanger in Electrowinning requires change out CE work and general optimization. Test work around the DMS Scrubbing circuit was also required at the Kipoi Project. Commissioning at Sentinel represents one of the largest projects we have been involved with, comprising a team of 12 to provide a range of services from the final stages of construction, commissioning management, mechanical supervision, QAQC and operator training, complete with SOP’s developed by PPM’s technical writer. PPM provided two Process Specialists to bring the project from the final stages of construction into commissioning and operation. Our team provided some excellent troubleshooting capability during start up and went on to assist with ramp up of production and training of operations personnel. We were engaged by FLS to supply 2 Process Specialists to assist with the implementation of plant (process) commissioning and development of commissioning documentation such as commissioning plan, schedule and check-sheets. Establishment of continuous operation of mechanical equipment, testing and sign off of commissioning check-sheets. Rectifier start up for plating of “first copper” and commissioning of the EW plant and cathode handling equipment were carried out successfully, followed by assistance with ramp up and operator training. Despite the many challenges of Kazakhstan, not the least of which is an annual temperature range of – 40°C to +40°C, PPM assisted Central Asia Metals with the commissioning of a 10,000 tpa copper SXEW plant and the subsequent production of Kazakhstan’s first commercial EW copper cathodes. Post commissioning, PPM were retained to assist with training of operations personnel and ramp up of the production rate. Having undergone several phases of expansion in recent years, Mutanda Mining’s MUMI Operation currently comprises two milling circuits, four copper SX plants and six EW plants and a cobalt recovery circuit. Design production capacity of copper cathode is approaching 120,000 tpa. In addition to this significant rate of copper production, MUMI also has one of the highest in-situ cobalt grades in the world. PPM Process Specialists have been on site at MUMI throughout 2012 providing assistance with commissioning of new equipment, optimisation of the copper plant and training of operations personnel. On behalf of our client at Kevitsa, First Quantum Minerals, PPM managed the commissioning of a 7.5 Mtpa flotation plant producing nickel, copper and PGE’s in concentrate. Additionally, PPM developed commissioning, operating and training procedures for the operations personnel and carried out operator training during the commissioning and ramp up of the plant. Whilst our mineral processing specialists have 20+ years of experience, working in the Arctic Circle with zero daylight for some months of the year was certainly a new experience for all members of the team. Our client at Ravensthorpe, First Quantum Minerals (FQM) , purchased the Ravensthorpe assets from BHP Billiton in 2010 and carried out modifications to the plant design. During 2012, PPM personnel assisted with commissioning of materials handling and beneficiation equipment in the “front end” of the complex nickel laterite process plant. The successful refurbishment and commissioning of the plant has seen FQM achieve and maintain high production rates of nickel / cobalt concentrate from the Ravensthorpe Nickel Operation. 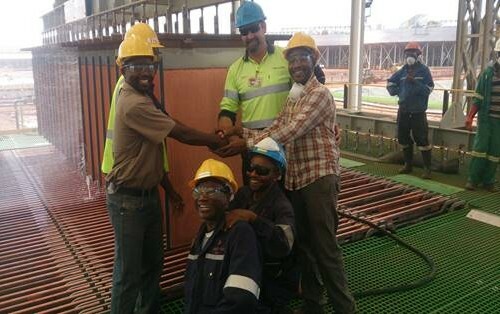 PPM’s team of copper SXEW specialists have been engaged by Katanga Mining to commission the Phase 4 SXEW expansion at Kamoto Copper Company in the DRC. The project consists of three SX trains, each with a design capacity of 90,000 tpa copper and an EW tankhouse capable of producing 200,000 tpa of copper cathode. Anvil Mining engaged PPM at the Kinsevere Project in DRC to manage the process commissioning of the company’s 60,000 tpa Leach/SX/EW plant, commencing late 2010. Commissioning at Kinsevere marked the start of acidic milling in African copper operations – a significant step forward in the efficiency of copper leach plant design. PPM personnel were retained by the client throughout 2011 and 2012 to assist with the ongoing ramp up of production and training of process personnel. PPM’s role at the Leigh Creek Copper Project was to manage a brownfields project involving the mechanical refurbishment and process commissioning of a copper leach / cementation plant. Additionally, site infrastructure was added including an analytical laboratory, workshops and materials handling equipment. The project generated its first copper cement product during third quarter of 2010. The Lady Annie Operation is a heap leach / SXEW plant situated in the Mt Isa region in Queensland. PPM have worked with the team at Lady Annie Operation since 2007 and during that time provided a range of services including commissioning support during both greenfields and brownfields phases, operator training and technical support. Additionally, PPM supplied electrolyte filtration equipment to Lady Annie during the company’s expansion from 19,000 tpa to 30,000 tpa cathode. Matrix Metals engaged PPM in 2007 to manage the (re) commissioning of the Leichhardt Operation near Cloncurry in Queensland. Following a period of plant refurbishment and the stacking of oxide copper ore, PPM’s team coordinated the establishment leaching operations and commissioning of the 5,500 tpa copper SXEW plant. Following the successful start up of the operation, PPM returned to site in 2008 to provide technical support and commissioning assistance for the expansion of the plant to 10,000 tpa. PPM’s scope at Brown’s Oxide included the provision of technical support, development of training manuals and commissioning of the copper SXEW plant. The complex ore at Brown’s Oxide required agitated leaching at temperature, followed by CCD and recovery of copper by SXEW. Commissioning and production of copper cathode was achieved during the fourth quarter of 2008. Our client, Ausenco Engineering, engaged PPM’s services to assist with commissioning of the Gosowong Gold Project on the remote island of Halmahera in Indonesia. Reaching the island only by helicopter, commissioning personnel carried out start up of milling, gravity gold and gold recovery circuits during an expansion project at Halmahera. Set in the picturesque New England Plateau area of New South Wales, Hillgrove represented one of the few operations in the world recovering antimony by direct electrowinning. PPM provided the client, Straits Resources, with commissioning assistance for the complex process comprising milling, caustic leaching, gold recovery and antimony electrowinning. PPM’s role at KCM in Chingola, Zambia was to provide consulting services in the SXEW plants to support the optimisation program being carried out during 2005 and 2006. Our services at KCM services comprised both metallurgical consulting and the development of operating procedures.